DIY Income Investor: DIY 'Dogs' - and another Portfolio Sale! One of my favourite TV programmes is the Dog Whisperer. Mexican-born Cesar Milan takes unmanageable canines and reshapes their unacceptable behaviour - and, more importantly the behaviour of their owners. 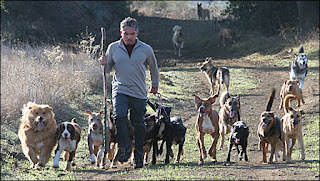 He roams the hills of California with a pack of dozens of 'problem' dogs that he is treating at his rehabilitation centre. I always thought the DIY Income Investor portfolio was going to be a 'buy and hold' portfolio - sweeping up the share dividend and bond coupon shavings from the floor. But that's not how it has turned out - it looks like I am actually a kind of 'value' investor - but only selling my winners. And in the process I have gathered my own small pack of 'dogs'. The stock market is for the most part a pretty unpredictable place. The constant stream of news pushes and prods the prices of the thousands of securities, which themselves are linked together by a complex spider's web of inter-relationships - one moves and it pulls along a lot of others. I'm constantly in awe of this churning mass of greed and fear. However, in my own relatively quiet high-yield corner of the market I noticed a regular pattern: dividend shares would increase in value, then fall back - very few would actually break out of a price range. Of course, there is a price change at the time a dividend share goes ex-div but I'm referring to larger 'secular' price trends. Many times I watched my dividend shares rise in value, only to fall back - sometimes for no apparent reason. Now, it is a human failing to want to grab a profit before it disappears but experienced investors will tell you to 'hold on to your winners'. That created an unwelcome tension in my investing activity - the kind you almost feel in your stomach. And that is how I developed my 'sell' signal, which is to consider selling when the price rise is equivalent to 5 years' worth of current income. The '5 years' bit is fairly arbitrary - but it seems like a long time to me. So, with that forward income in the bag, it feels like I can reinvest the capital and (hopefully) double my income! There are a couple of provisos to this sell rule - if the yield is still attractive (above 5%) and prospects for a sustainable dividend and further price gains look good I might bite my fist and hold on. This rule has been surprisingly helpful in reducing my inner tensions - I can ignore most of the price-churning that happens. Moreover, in many cases I have sold on medium-term market highs. I recognise that this may be down to luck for the most part, as the price that I originally pay is a key factor in the 'sell' equation. However, I do use some basic yield and value criteria when I buy, so there is just possibly a testable hypothesis there. These flea-bitten canines sit in my portfolio scratching themselves without paying much for their keep in the way of dividends. However, I don't so much whisper to them as ignore them completely. But they are not completely hopeless - some (like SEGRO and NWS) have revived themselves (and been sold) and several continue to improve their share price. if not their dividend: for example, LLOY has dragged itself up by 100% over the past year and BP continues to recover. The dog pack accounts for under 15% of the portfolio purchase price and just over 6% of the current portfolio value, so I wouldn't accept that it is a big deadweight but I admit it's more than I would like. Having said all that, my 'sell' signal flashed yesterday for Braemar Shipping Services (LSE:BMS) - definitely not one of the 'dogs', rather one of the stars, showing a 35% gain since just April 2013. And amongst my dog pack, BP has perked up his ears with a rise of 5% today, taking the DIY Income Investor portfolio to a 20% total return so far in 2013. Interesting that you have devised a sell trigger for upward price moves but not for downward ones. maybe such a rule would prevent you being a dog shepherd?! Wow, I'm amazed at the amount of selling you do and also your success at it. Selling my winners in recent years has been an unmitigated disaster. Whilst my one dog sell has so far been a good decision. I tend to sell mainly use my and my partner's CGT allowances each year, but will sell a dog share in order to utilize the capital loss against something with a large gain that exceeds the CGT allowance. My dog sell was RBS @ 465p to offset a 50% sell of my DNLM shares @ 300% profit. Great, except that the other 50% are now showing a 680% profit. DGE @ 135% profit also seemed a good idea except that they are now at 155% profit. RR sold @ 200% profit is now at 395% profit, but fortunately I had the good sense to buy these back and some more after the 30 day CGT limit. Likewise IAPD sold @ 100% profit, but bought back in my ISA at the same time has added another 20%. So I've pretty much learned to run my winners now, but it's still such a wrench trying to force myself to sell the dogs. I've been sitting on the fence for the last week or so, regarding whether to hold or sell. It seems that the share price may have risen due to the increase in shipping rates recently. However, the Baltic Dry Index now seems to be plummeting (down 25% from the recent high) and may indicate the end of China's restocking of Iron Ore. I think that I'll also play safe and lock in my profits, despite the still decent dividend yield. Keep the comments coming! Always thought-provoking.